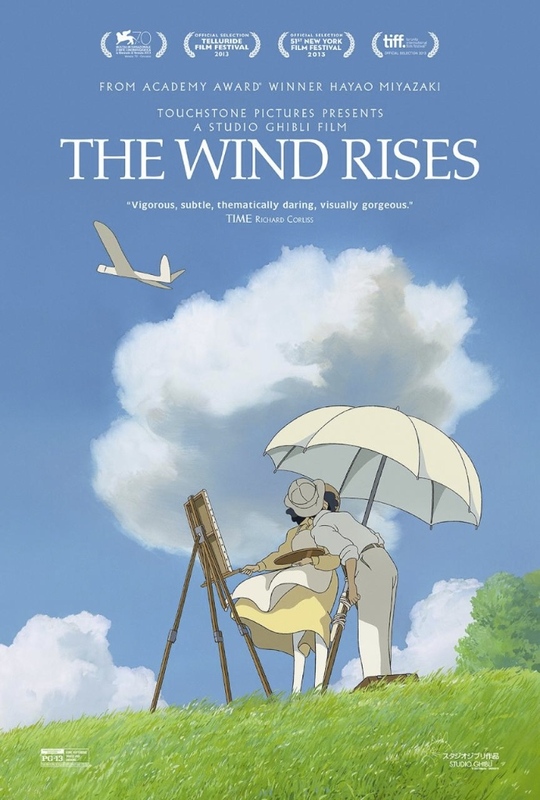 The latest, and apparently the last, animation from Studio Ghibli’s great Hayao Miyazaki, The Wind Rises takes its title from a couplet in Paul Valéry’s poem The Graveyard by the Sea: “The wind is rising / We must try to live!”. These lines appear at the end of the opening credits and what follows is, to some extent, an examination of the challenge of living a life in dark times. The Wind Rises is in fact a fictionalised account of the early life of Jiro Horikoshi, the designer of two great Japanese WW2 fighter planes – the Mitsubishi A5M and the Mitsubishi A6M Zero – but a man who also opposed Japan’s involvement in the war. The tone of the film is set right at the start. A young Jiro (Hideaki Anno) dreams of taking to the air in a plane that sits atop his house. As he soars above the ground, this scene appears a classic example of flight as a metaphor for personal freedom and liberation. However, the mood of the dream changes as, from behind a cloud, a huge airship appears, with bombs and sinister dark figures hanging below it. Jiro’s airplane is struck and crashes to the ground, at which point he wakes from his dream. Later, at school one of Jiro’s teachers lends him an English aircraft magazine. It contains a photograph of Count Caproni, the famous Italian aircraft designer. Jiro subsequently dreams of meeting Caproni. Jiro’s poor eyesight precludes him from being a pilot, but Caproni tells him that it is better to design planes than to fly them. He tells Jiro that airplanes are “beautiful dreams”. Jiro’s dreams and daydreams recur throughout the movie. As a young man he goes to work for the Mitsubishi corporation, who are busy trying to build warplanes for the Japanese navy. In a dream, Caproni tells him that airplanes are “cursed dreams, waiting for the sky to swallow them up”. However, both agree that a world with airplanes is better than one without or, as Caproni puts it: “Do you prefer a world with pyramids or no pyramids?”. We see that Japan’s technology is lagging behind that of Europe, the most potent illustration of this being the way that oxen are used to pull new airplanes out to the airfield. With Japan committed to a war that Jiro doesn’t want, he nonetheless strives to build better aircraft for his country, eventually producing machines that far exceed the navy’s specifications. Throughout all this there is the romance between Jiro and Nahoko (Miori Takimoto). The two first meet in 1923 when, during a train journey, she catches his hat after it is blown off by the (rising) wind. Shortly afterwards, the Great Kanto earthquake strikes and Jiro carries Nahoko’s maid to safety after she breaks her leg. He leaves without introducing himself but, a few years later, they meet again when Jiro catches her parasol which has been blown away by the wind. Their romance is not straightforward, to say the least, and there is a certain ambiguity about Jiro’s character as he leaves his sick wife alone whilst he devotes himself to his work. Could he have behaved differently or was he effectively compelled to work for Japan’s war machine? (at one point, for reasons he does not understand, Jiro finds himself wanted by the “thought crime boys”). One of the most beautiful scenes in the film occurs when Jiro entertains Nahoko by launching a simple paper plane into the air, and the two then take turns sending the little white creation between them. This moment, more than any other, captures the purity and beauty of the dream of flight. When we later see a white Mitsubishi Zero take to the air, it is possible to forget – if just briefly – that this is a deadly machine, as it takes us back to the flight of the paper plane. In Japan, The Wind Rises has caused political controversy. Nationalists are unhappy about references to the “futility” of war, whereas left-wingers wonder why a positive picture should be presented of someone so closely associated with the war machine. From a British perspective it is worth reflecting that the inventor of the bouncing bomb, Sir Barnes Wallis, is widely regarded as a heroic figure, and The Dambusters is a much-loved film – despite the fact that this raid killed thousands of people (including allied POWs), and would nowadays be classed as a war crime. But another war film that came to mind as I watched The Wind Rises was Empire of the Sun. That film’s protagonist, the boy Jim, is imprisoned in a Japanese internment camp. However, he – like Jiro – is obsessed with flight and airplanes, and sees both Japanese and American pilots as heroic figures. In one scene, Jim is walking near the perimeter fence when a model airplane thrown by a Japanese boy on the other side lands nearby. Jim throws it back and is thanked by the other boy. It is another great cinematic illustration of the beauty of flight and the way that it captures the human imagination regardless of nationality. As with all the films from Studio Ghibli, the artistry of The Wind Rises is gorgeous. The story is a more adult one than is normally the case, but certainly none the less powerful for that. Indeed, as someone who rarely watches animated films I was absolutely caught up in the lives of the characters, and was moved emotionally. It is a film that stirs us and makes us appreciate the beauty of flight, although ultimately it is a very melancholy tale too. This is one of my favourite films of the year so far and one of the greatest animated movies I have ever seen.